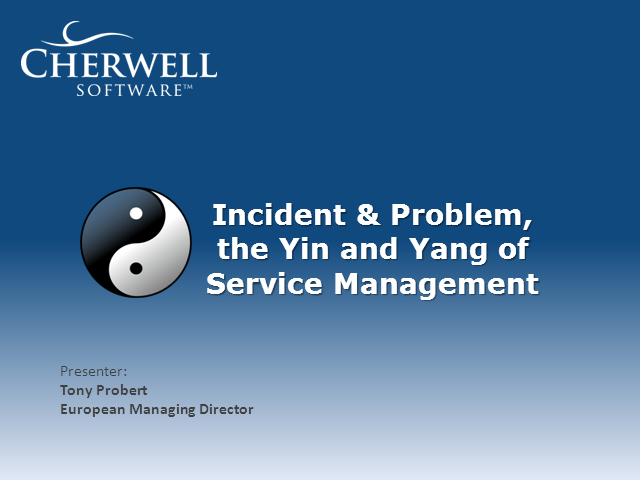 The need for effective Incident and Problem Management is inextricably linked, as they are the Yin and Yang to one another. Yet, for many organisations the implementation of Problem Management continues to be overlooked or avoided. Why is this? It should be easy to implement and offers the promise of significant business benefits. In the current economic climate the goal for any organisation, as defined in ITIL terms, should be to drive ‘Continual Service Improvement’. The effective delivery of Incident and Problem Management has the potential to deliver significant impact on an organisation’s overall performance and productivity on many levels. In this webcast Tony Probert will highlight issues that need to be considered and identify service desk process management, workflow and process integration to create effective Incident and Problem Management to drive increased business value.